England prop Joe Marler's World Rugby misconduct hearing "smacks of double jeopardy", according to the Rugby Players' Association. 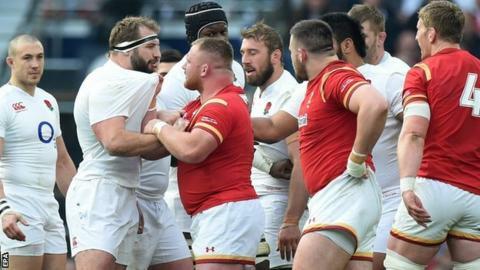 Marler has been charged for calling Samson Lee "Gypsy boy" during England's Six Nations win over Wales. The 25-year-old has already been cleared by Six Nations organisers and had his apology accepted by Lee. But RPA chief Damian Hopley, said Marler is "being hung out to dry" by an "excruciating media witchhunt". "It is important to place on the record how we have watched the events around this ongoing disciplinary process unfold in a state of disbelief," said Hopley, the RPA's chief executive officer. Rugby's world governing body asked Six Nations organisers to explain the decision not to punish Marler for his comments to Lee, who is from the Traveller community. He faces a hearing on 5 April, with World Rugby saying the prop's remark "amounts to misconduct and/or a breach" of its code of conduct. RPA chief Hopley, a former Wasps and England winger, added: "Let's be absolutely clear, Joe is not racially motivated and this matter should have been closed when it was originally dealt with three weeks ago. "We will be watching the ensuing process extremely carefully but the thought of World Rugby calling for yet another hearing and therefore prolonging this episode defies belief."